The cast have wonderful names like Lady Sneerwell, Miss Gadabout, Miss Filigree Flirt, Benjamin Backbite and Mrs Candour. This is used to best effective for the three characters with the surname Surface, all of whom are more than what they seem. The story has love triangles, infidelity, old men with young wives, gambling, hedonism and general malarky. It is meant to be funny and there are some very good lines in it. There is also a great scene where a married woman is with her suitor (who everyone thinks is terribly moral) when her husband arrives so she hides behind a screen. Her husband and her suitor are discussing the infidelity and general poor morals of a third man when he too arrives so her husband hides in a cupboard. The third man asks the suitor at great length about his affair with another woman (not the one behind the screen). Then, as you can imagine the whole thing unravels and he is discovered for who he really is. For the audience it has that air of creeping inevitability which must be great to watch in the theatre. According to the very lengthy introduction it is scathingly satirical, but I thought it was actually rather celebrating the gossip-mongering. Sheridan was absolutely of the class he was lampooning having been educated in Harrow and raised in Bath and you get this sense throughout the book. You suspect that although he has been the victim of the sort of made-up tittle-tattle that he is writing about, he has also that he has joyously indulged in it. All in all I would definitely go and see this in the theatre, but maybe not just read it as a play. It is very light on anything other than the script and I think a lot of the humour falls from the timing and tone in which the lines would be delivered. 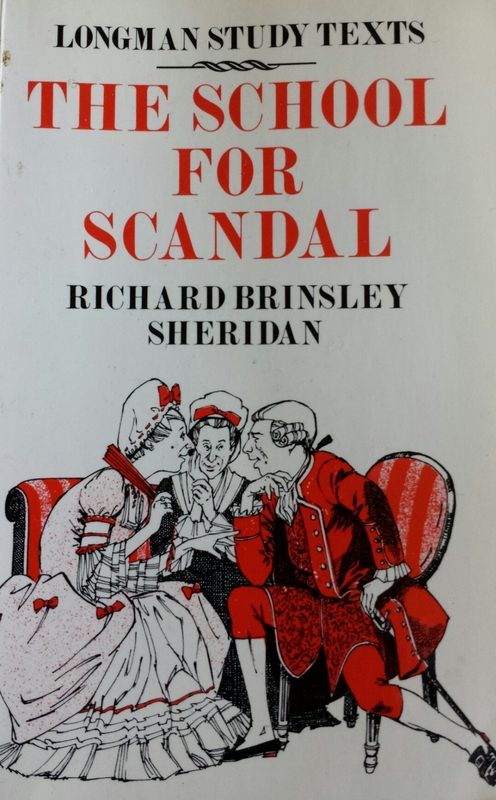 Tags: 18th century, book, book review, books, gossip, London, Plays, School for Scandal, Sheridan. Bookmark the permalink. I love this play! I’ve never seen it performed though. I think you’re right, the timing of performance would make the comedy really come alive. Yes, I will definitely be keeping an eye out. It has to come back to London again soon!